If blood-thirsty, blood-devouring vampires are your thing, this Universal Monsters Dracula Vintage Travel Lithograph Art Print belongs on your wall… right above your coffin! 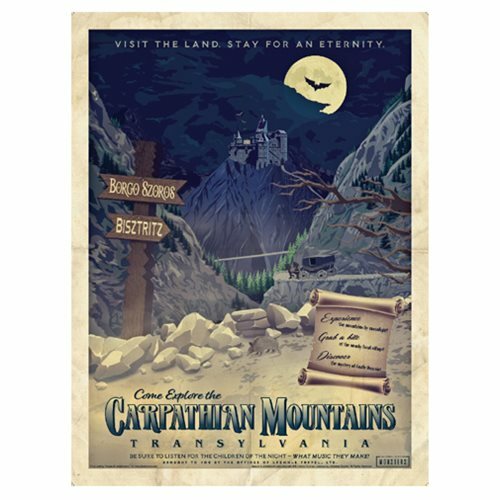 "Come Explore the Carpathian Mountains" of Transylvania," as the poster implores, and "Be Sure to Listen for the Children of the Night," as it suggests. "Visit the Land. Stay for an Eternity." We guarantee an undying experience! Measures 24-inches tall x 18-inches wide and is printed on heavyweight 100 lb. acid-free paper.